Home / Entertainment / news / Shatta Wale / Zylofon Media Label / Shatta Wale Signed Unto Zylofon Media Label For $ 1 Million? Shatta Wale Signed Unto Zylofon Media Label For $ 1 Million? 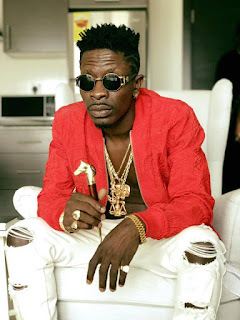 Yesterday Dawuroo.com made a hint that the Entertainment Giant in Ghana now Zylofon Media is planning to add to its collection of Music Arts, the self-acclaimed king of Dancehall Shatta Wale. Recently a photo surfaced online showing self-acclaimed Dancehall King, Shatta Wale, and his former manager, Nana Asiama Hanson aka Bulldog who is responsible for talent scouting and overseeing the artistic development of recording artists at Zylofon media. There were speculations earlier on that Nana Appiah Mensah, the CEO of Zylofon Media was trying to sign Shatta Wale but former Manager of Shatta Wale, Bulldog addressed the rumours. It is speculated that a $1 Million and other packages are involved in the contract. Your No.1 source of Entertainment news will update you on the progress of the deal as Zylofon Media is yet to make an official announcement of the signing of Shatta Wale very soon. Stay with us and Read more articles.